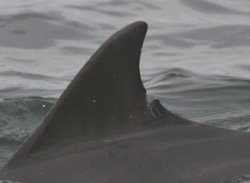 The Shannon dolphin ID catalogue, which contains dorsal fin images of 175 dolphins, has been upgraded with the 2005 field data. The use of photo-identification is very powerful and we have been taking images of the Shannon dolphins since 1993. 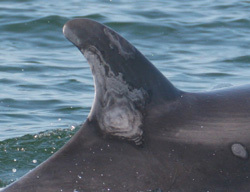 Some of those dolphins (for example ID 001) is still recorded each year in the same area off Kilcredaun Head, 12 years later. 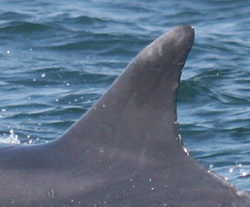 Using this technique we can determine dolphin associations, home range and habitat use and record which dolphins have had calves. Funding from the Heritage Council at the end of 2004, through the Department of Environments capital grants, enabled the SDWF to purchase a new Canon EOS D20 digital camera. This has revolutionised the collection of identification images and has increased the proportion of identifiable dolphins. 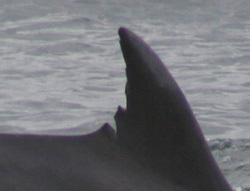 Images from 2005 have know been added to the on-line catalogue http://www.shannondolphins.ie/photoID.asp . This facility will allow you to see if you can recognise any of these individual dolphins on your next visit to the Shannon estuary.